Motorola today just revealed the MOTO Z2 Play which succeeds the MOTO Z Play. We were already aware of this launch thanks to the numerous tidbits of information and more importantly a direct intimation from Motorola Canada. The new handset continues the Play lines mission of providing a more pocket-friendly flagship to the masses. So let us discuss what Motorola treats us to with this new smartphone. If you keep the MOTO Z2 Play next to its predecessor you would be hard-pressed to identify the difference. In rough shape and in-hand feel, the two devices are very similar. Featuring a 5.5-inch full-HD (1080 x1920) AMOLED panel that dominates the front with a home button which integrates a fingerprint scanner in the chin bezel. The first difference is in the shape of the home button which is shaped as a square in the old device while it is shaped like a lozenge in the Z2 Play. Apart from that, the Z2 Play features a forehead bezel which houses the earpiece flanked by a selfie-shooter and its LED flash element. 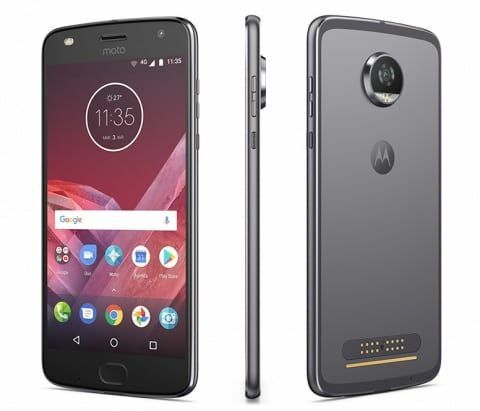 View the handset from the side though and this is where you see a major difference, the body of the MOTO Z2 Play sheds over 3mm of fat vis-á-vis its predecessor making it 5.9mm thin. The other dimensions of the device are 156.2 x76.2mm which is just a slight reduction compared to the outgoing MOTO Z Play. The right side of the handset houses the volume rocker and power button while the left is bereft of anything. Flip the phone and you are greeted with the same layout as last years MOTO Z Play, a protruding camera module at the top with the MOTO MODs contact points at the bottom. The entire rear frame though does feature a redesigned antenna band. The MOTO Z2 Play houses its SIM slot on the top and at the bottom of the frame features a 3.5mm audio jack and a USB Type-C connector. What Motorola has changed for the Z Play’s sequel has been internal. The MOTO Z2 Play is powered by a Qualcomm Snapdragon 626 SoC featuring an octa-core CPU coupled with an Adreno 506 GPU. The device gets its RAM and storage bumped up to 4 GB and 64 GB, respectively. As stated, the handset features a 5.5-inch full-HD AMOLED panel based display. The camera at the rear is a 12-megapixel sensor with a f/1.7 aperture with support for PDAF, Dual pixel technology and a dual LED flash. Selfie duties are handled by a 5-megapixel sensor up front with a f/2.2 aperture capable of capturing full-HD video and has Motorola’s first dual LED flash up front. Remember we said that the frame of the MOTO Z2 Play had slimmed down considerably, it was because the battery inside the handset was reduced to a 3000mAh unit. Out of the box, the Z2 Play is running on a close to a stock flavour of Android v.7.1.1, Nougat. Apart from the hardware, Motorola has a USB Type-C connector for charging the battery which features the company’s proprietary TurboPower technology for quicker top ups. The Dual pixel technology on the camera allows for a quicker focus acquisition and thus lower instances of blurry images. 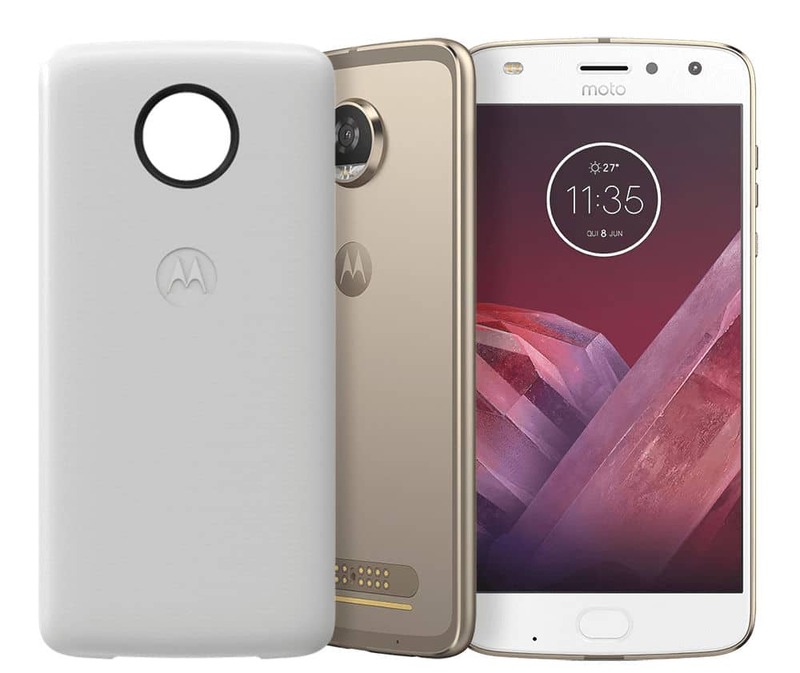 The MOTO Z2 Play has currently only been announced for the US and Canadian markets, carrying a price tag of $500 (~₹32,000) for an unlocked unit. Verizon mobile will have the phone available on contract although we have no details on what kind of plans we are looking at. The smartphone will be available in three colours; Lunar Grey, Nimbus Blue and Fine Gold. Due to the MOTO Z2 Play having close to the same physical dimensions as its predecessor, these MOD’s are backwards compatible as well. The Style Shell MODs will be priced at $40 (~₹2,575) while the others will retail at $80 (~5,150).